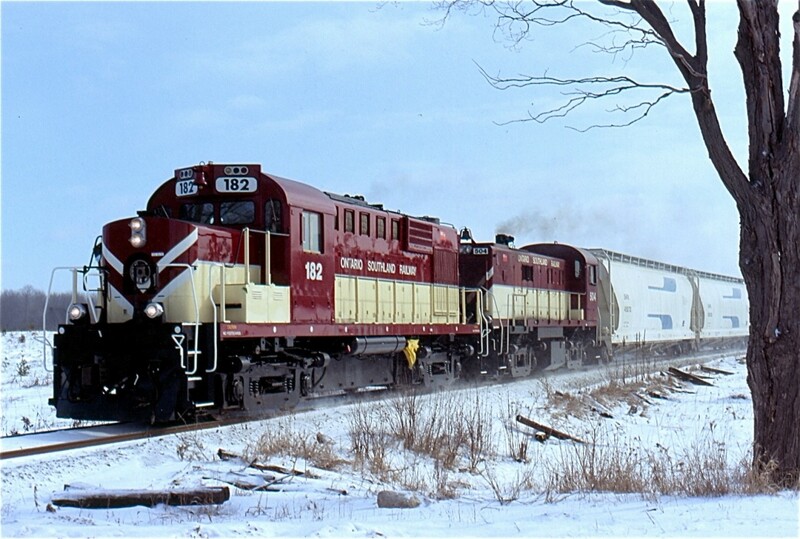 Railpictures.ca - Marcus W Stevens Photo: In early 2006 OSR 182 was the freshest looking unit on the companies roster. OSR’s Guelph Jct. RR at that time was all 251 prime mover equipped MLW built units, mainly RS18s and RS23s. The182 last worked for the Quebec Gatineau RR. The days train is seen storming northward out of Moffat towards Guelph for a day of switching the industries in town. | Railpictures.ca – Canadian Railway Photography – photographie ferroviaire Canadienne. Caption: In early 2006 OSR 182 was the freshest looking unit on the companies roster. OSR's Guelph Jct. RR at that time was all 251 prime mover equipped MLW built units, mainly RS18s and RS23s. The182 last worked for the Quebec Gatineau RR. The days train is seen storming northward out of Moffat towards Guelph for a day of switching the industries in town.